Englewood Country Liners (ECL) held a Food Drive during the holiday season, where non perishible food and personal care items were given to St. David’s for distribution to the needy. The Liners continue their support of hometown charities as a fun and community minded non-profit club. In addition, on occasion, members can volunteer to entertain at local nursing homes. All who know basic dance steps are welcome to join them every Thursday from 9:30 to 11:30am at Christ Lutheran Church, 701 North Indiana Ave. For further information, contact Nancy Vargo, President at 474•6027 or nvarg064@gmail.com or visit www.facebook.com/englewoodcountryliners. 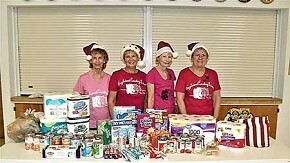 Shown with the donations are Ann Wagner, Sunshine/Historian, Margot Kidman, Vice-President, Jayne Parker, Secretary and Nancy Vargo, President.